This Purim: Join And Be A Part Of The Tri-State Area $130,000 Mishloach Manos Campaign! Misaskim, the organization that supports individuals during times of crisis and tragedy, will be delivering gourmet meals this Purim. Approximately 3,000 widows and orphans in the tri-state area will be receiving their Purim meals from Misaskim, as a Mishloach Manos. The meals will be delivered and enjoyed in the comfort of their own home, with family and friends at their table. These meals are replete with entrees, soups, side dishes, challahs, beverages, desserts and paper goods; a complete Mishloach Manos package. You can be a KEY part in their Simchas Purim by donating here. 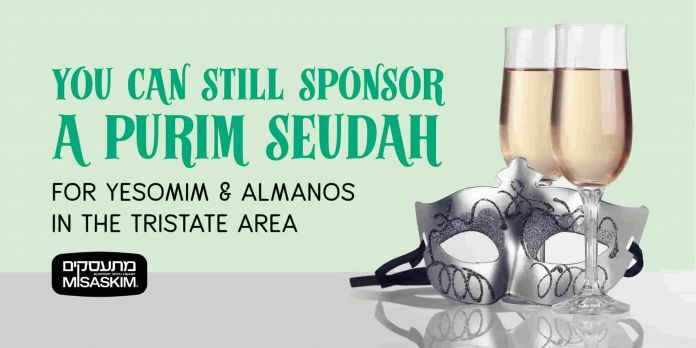 Donate with #Purim2019 in the comments and make a difference today.